Dr. Lutz ‘Joe’ Amechi, MD SGU ’93, resident physician and managing director of St. Augustine’s Medical Services (SAMS), celebrates sustained efforts to expand healthcare services in Grenada, introducing the nation’s first hyperbaric chamber and a 64 slice CT machine. St. George’s University is partnering with SAMS to provide medical students with a clinical selective in hyperbaric medicine. Rated among the top diving destinations in the world, Grenada regularly welcomes fervent divers and major diving clubs to its waters. However, with no hyperbaric chamber on island, the risk of decompression sickness—also known as divers’ disease or the bends—remains a constant threat. An avid diver while attending St. George’s University, Lutz “Joe” Amechi, MD SGU ’93, often wondered what happened if divers were stricken with the bends, which can result in crippling injuries—even paralysis or death—due to arterial gas embolisms. 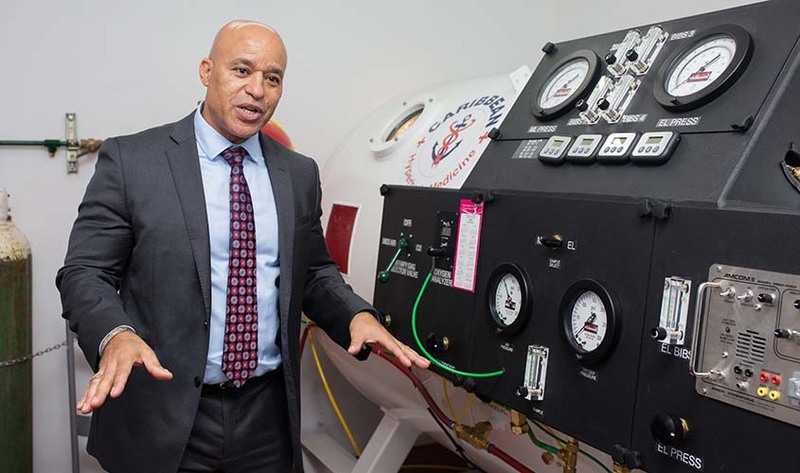 More than two decades later, Dr. Amechi has helped secure Grenada’s first hyperbaric chamber at St. Augustine’s Medical Services (SAMS) in hopes of significantly reducing the effects of dive-related injuries. Additionally, SGU has partnered with SAMS in starting a selective in hyperbaric medicine, with the first group of students slated to participate this fall. As faculty advisor, Dr. Duncan Kirkby was instrumental in both acquiring and building an educational program around the hyperbaric chamber. 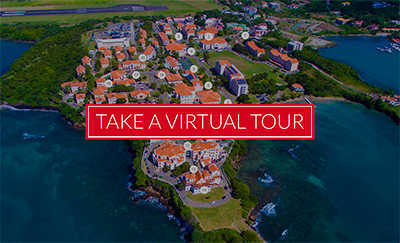 Also teaching the course in conjunction with SGU is Dr. Tyler Sexton, President and Chief Executive Officer of Caribbean Hyperbaric Medicine (CHM) and a former student of Dr. Kirkby. 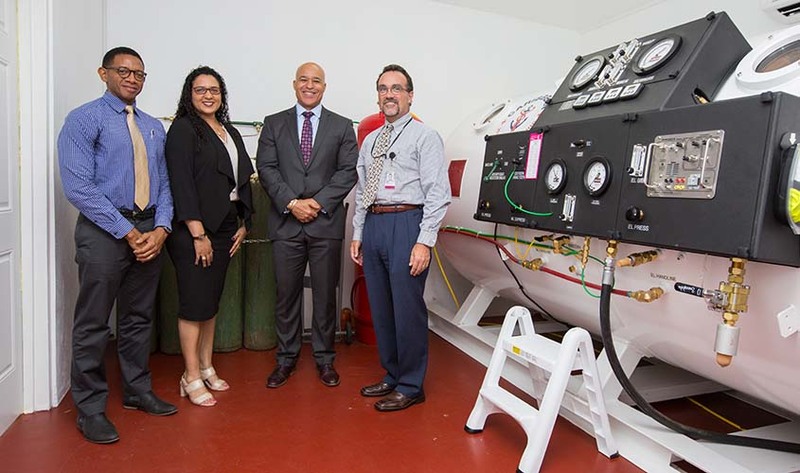 Working with SAMS to supply both the hyperbaric chamber and the medical knowhow, Dr. Sexton created CHM to focus directly on bringing these types of programs to the Caribbean. According to Dr. Sexton, the fully remanufactured hyperbaric chamber is accredited by Divers Alert Network and is recognized by the American College of Hyperbaric Medicine. It has the capability of treating four patients at once and houses seven breathing systems. It can perform approximately 100,000 dives before having to replace any of its parts and is approved by the American Society of Mechanical Engineers and 510(k) cleared by the Food and Drug Administration. Used to deliver hyperbaric oxygen therapy (HBOT), the hyperbaric chamber was developed to treat underwater divers suffering from decompression sickness. It has since been approved for the treatment of air or gas embolisms, gangrenous digits and limbs, sickle cell disease, thermal burns, and other wounds that fail to heal through conventional treatment.